The U.S. economy should manage growth of 3% or more in 2015 despite a poor start to the year, the International Monetary Fund said Tuesday. Official data for the first quarter will be released April 29, and forecasters are marking down their numbers due to weak spending by consumers and businesses. The IMF cut its forecast for U.S. GDP growth in 2015 to 3.1%, from 3.6% in January. But that's still much better than 2014, when the economy grew by 2.4%. Low oil prices should begin to feed through to consumer spending, the IMF said, and even a gradual rise in interest rates and the strong dollar shouldn't prevent the U.S. from turning in its best performance since 2005. "For the U.S. the strong dollar is good but it slows down spending," said Olivier Blanchard, chief economist at the IMF. "But the U.S. has the tools to respond to it if the economy were to slow down. They could ... increase interest rates later, or may be able to use fiscal [stimulus]." The flip side of a strong dollar is a weak euro and yen, which have lost about 25% and 10% of their value respectively since the start of 2014. That should support the tentative recoveries in Europe and Japan. The IMF raised its forecast for eurozone growth to 1.5%, compared with 1.2% in January, and for Japan to 1%. Central banks in both economies are pumping vast quantities of cheap money into their banking systems to stimulate demand. At 3.5%, the IMF's global growth projection is unchanged since its last update and just a shade stronger than 2014. High levels of debt -- public, household, or corporate -- continue to act as a brake on the world economy. "Financial crises leave long scars," said Blanchard. "In most countries there is one of these things that is not right, there is a level of debt that is too high." Advanced economies will make up for slower growth in most of the major emerging markets. 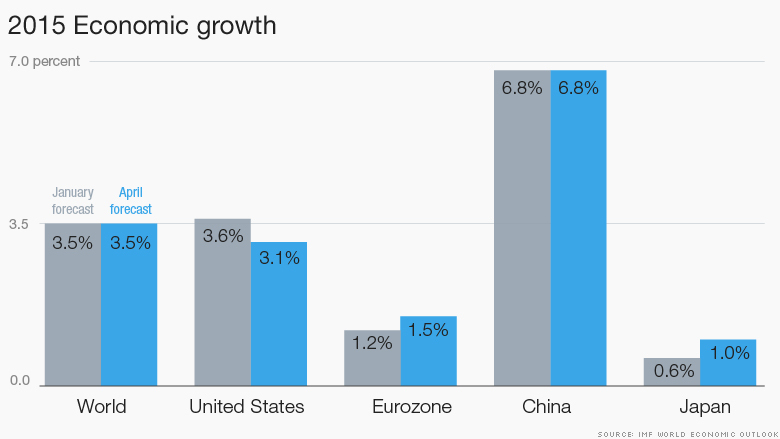 China's growth will slow to 6.8% from 7.4% last year. But India should power ahead with growth of 7.5% in 2015, according to the IMF.